We’re careful about covering hardware Kickstarters because so many of them fail to deliver. The Superbook laptop dockfirst popped up a few months ago, then it hit Kickstarter last week. Whether or not this device lives up to the hype, there’s enough hype that you should probably be aware of it. The Superbook has already pulled in more than a million dollars, and there are still a few more weeks left in the campaign. The Superbook is basically just a giant battery, a keyboard, trackpad, and a screen assembled in a package that looks like a laptop. It relies on your phone to provide all the computing power over a USB cable. 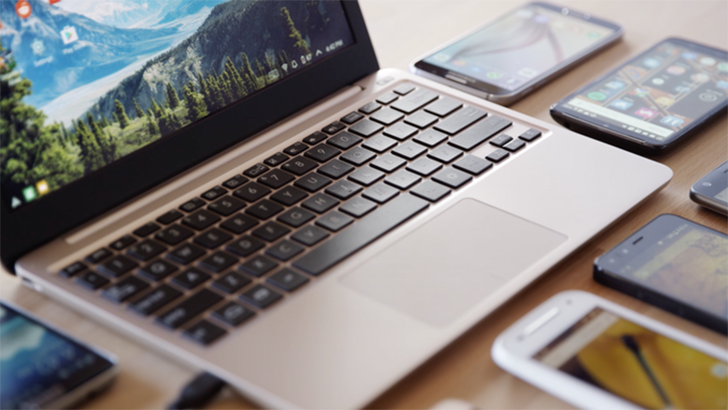 The Superbook comes from Andromium, which has already made an app and a phone dock that work like the Superbook, but without the built-in laptop hardware. It seems like the app, which you can install and play around with right now, is basically running an alternative interface on your phone, which is then mirrored on the Superbook screen. The Superbook starts at $99 (all the early bird deals are gone) and has already hit several stretch goals including an extra USB port and increased battery size. There’s also a new 1080p display upgrade option. With three weeks left, Andromium is going to have plenty of money to work with. Hopefully this is one of those hardware crowdfunding campaigns that works out.